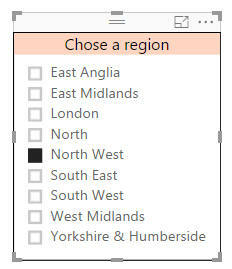 You can choose a region, but the slicer takes up loads of room in the report. You can click on the drop arrow to choose an item. When you click on the drop arrow you see the full list of items. 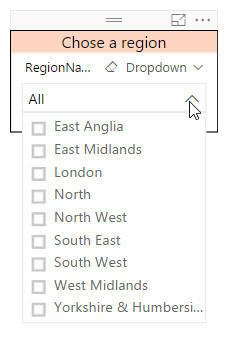 The annoying thing about the way Microsoft have implemented this otherwise excellent feature is that you have to display the header name (which I'm used to hiding) - that's why there are two titles in my example (one being the title set separately, and the other being the header shown automatically).